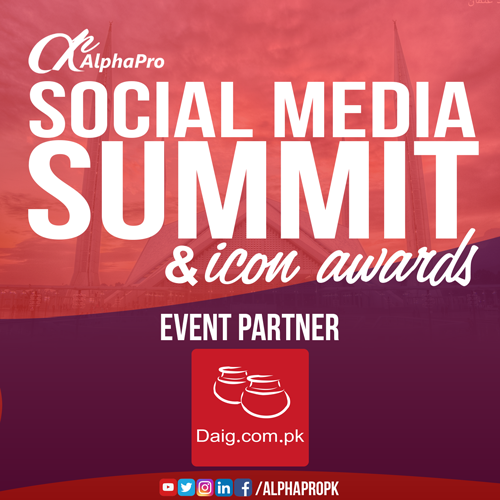 Digital media solutions and event Management Company AlphaPro is organizing a grand Social Media Summit in the federal capital in March, to promote the positive use of social media and forge related strategies accordingly. Daig.com.pk is its self an example of online business which is flourishing on social media. Daig.com.pk joins hands for the success of Social Media Summit 2018. This summit is going to be the first of its kind and will be continued in coming years for the betterment of our economy and our society. Daig.com.pk has joined hands in this initiative to empower the people of Pakistan with the vital uses of social media. Social media has both uses that take you to the extremes of positive and negative but Social Media Summit 2018 focuses on the positive utility. Recognizing the importance of social networks, the Social Media Summit aims at preventing misuse of this worldwide phenomenon in addition to providing learning opportunities for people interested in digital media marketing and to promote networking for people related to social media. Making this event successful will lead to more such empowering events for the locals of Pakistan. ← FM 100 Joins as Radio Partner to Make Social Media Summit 2018 a Big Success!